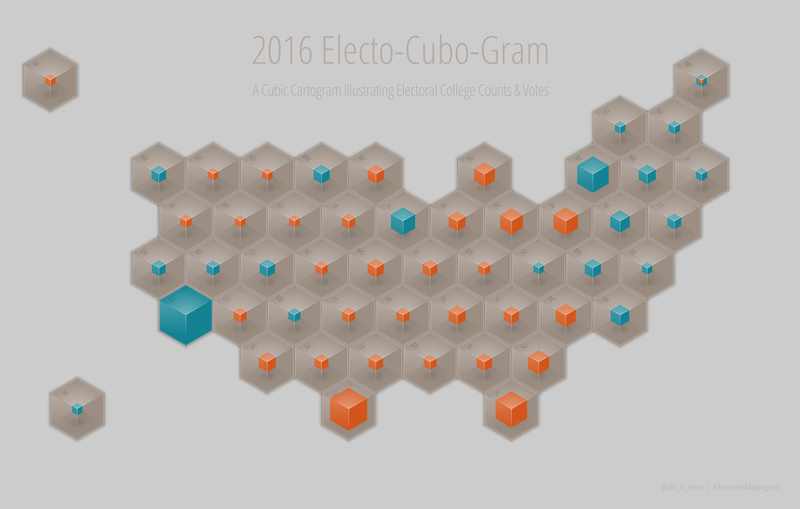 It’s an election cartogram, ok. But I tacked on some tacky graphics so now the hexagons look like cubes! Pew pew! If you are curious about how to make it, and/or want to re-use my cubifying graphics (a “cube front” image and a “cube back” image sandwich the graduated symbol layer) then have at it my friend! Here is a link to the hexagon cartogram shapefiles (polygons and centroids) if you are feeling ambitious, but not so ambitious as to start from scratch. Hi John, Thanks for another great blog! Of course I had to try this out. I’m having a problem with the tessellation. My hexagons are flat at the top/bottom, not on the sides, if you know what I mean:) Do you know what I can do to correct this? Thanks for the reply. I will try this out with the draw tools and download yours as well. This is fun!